Factory style one piece Convertible Top with 1 Plastic window. 4 Seater, Top frame stores behind the seats, has 12 Tenax fasteners. Top fits both Left hand & Right hand drive models. 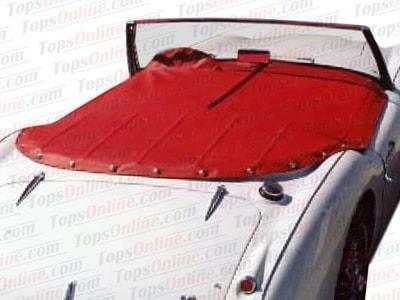 This convertible top for the Austin Healey 3000 BT-7 Mark 1 & Mark 2 fits the 1959, 1960, 1961 and 1962 model years. Made by Robbins Auto Top Company. Original style Tonneau cover with sleeves, flap folds back to studs at back of rear seat. We offer Left & Right hand drive models, please choose accordingly. Other colors can be ordered, please inquire.